What Is Social Selling and How Does it Work? 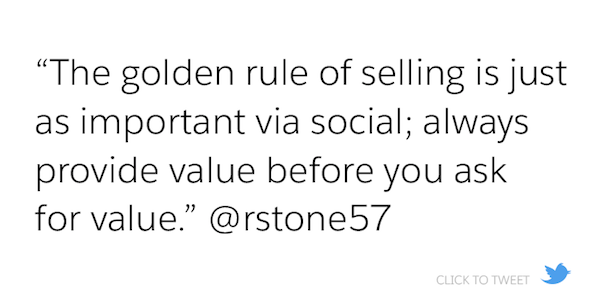 Buying and selling have always been social activities. Before our lives were lit by a thousand screens full of Facebook, Twitter, and every other glowing corner of the internet, people asked others they knew for buying advice, like chatting about lawn care companies over the garden fence. Today, social networks, forums, and online reviews have replaced the humble garden fence, and we’re all digital neighbors. Increasingly, the opinions of our social network and other consumers factor into our buying decisions. Research shows Millennials and Gen Zers are 4.1x more likely to say that user-generated content (e.g., product reviews, photos, or testimonials from other customers) is important when they’re considering a purchase. In this era of hyper-connected customers, social selling takes on a new prominence. Social selling is a lead-generation technique where salespeople directly interact with their prospects on social media platforms. Mike works in sales for a flooring company. On Twitter he sees that a woman named Monique is opening a bakery in his city and she’s looking for contractor recommendations. Mike sees this as an opportunity to recommend some companies he’s previously worked with, and sends her a message via social. Monique receives the message and sees in Mike’s social profile that he works for a flooring company. She’s been meaning to shop for flooring and puts Mike’s company on her short-list. Mike sends a follow-up note on social the following week, and Monique sets an appointment to visit his showroom. As you can see in this scenario, social selling isn’t a quick, one-and-done deal. But social channels are prime territory for connecting with new prospects and the foundations for new business relationships. When social media first appeared on every business’s radar, marketers quickly saw the value. Before long, most organizations were busily broadcasting on social channels in an attempt to load the sales funnel at the top end. Today, however, winning organizations are increasingly using social tools throughout the sales process. In fact, 78% of social sellers outsell peers who don’t use social media. 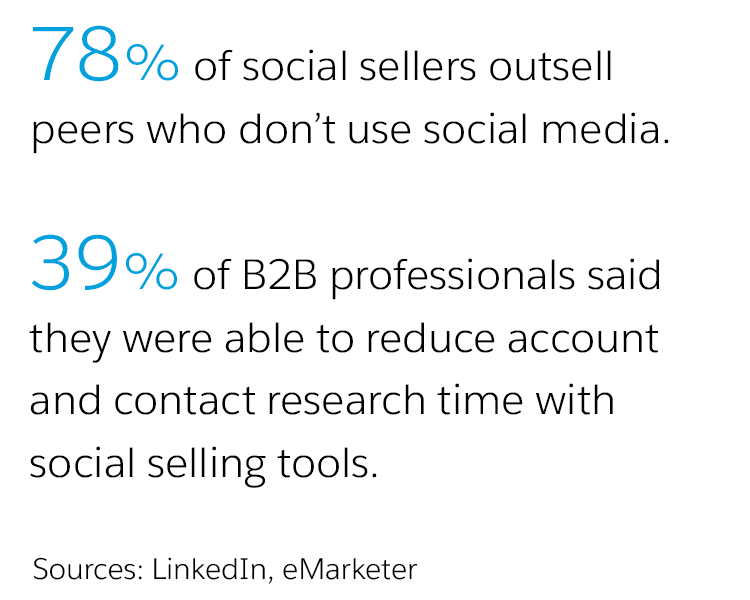 Among B2B professionals, 39% said they were able to reduce account research time with social selling tools. Whether you leverage your professional network on LinkedIn for sales prospecting or build your Twitter following to nurture relationships in your industry, social selling is a powerful tool to have in your sales arsenal. As the pace of business accelerates, sales reps are spending more time in front of a screen. 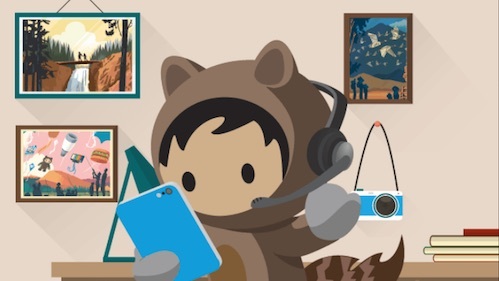 The “State of Sales” report found that reps’ time spend connecting virtually with customers has increased 3.2 times more than time meeting customers in person. And as social media has expanded its reach over the last decade, the user base has extended well beyond Millennials. A report by Salesforce Research found that 51% of Baby Boomers and Traditionalists have interacted with a company via social media. Among Gen X, that jumps to 69% and 86% for Gen Z and Millennials. As younger generations rise in purchasing power, social selling will open up even more opportunity. Now let’s dig into a few tips for social selling. Your potential customers may well be discussing their needs online — posting comments on forums, asking their followers on Twitter, and updating their status on LinkedIn. You just need to be listening. Free tools such as Google Alerts, and of course our own Sales Contact Management and Social Studio, can offer insight into what your customers are discussing online. Put them to good use, and you’ll be able to understand individual customer needs and broader market trends — stepping in to offer targeted, perfectly timed advice. Jane is head of sales for a company that sells business consulting to professional services firms. She knows that firms buy from her business when they face significant changes — like sudden expansion or contraction, a merger, or consolidation. Jane sets up a series of ongoing searches for trigger phrases in social media. She follows key target companies on LinkedIn, looks for new job postings, and keeps up with breaking news. She also comments on industry blogs whenever he has insight to offer. Jane is far more likely to be in the right place at the right time when a sales opportunity does come up. Even better, she’s already hooked into the conversation and demonstrating value — a huge head start over her competitors. It doesn’t take her long to set up those searches and offer up those first few words of wisdom. She’s able to get started in social selling in no time, leaving him free to spend the evening with his family. You may be pitching the best product or service around, but that’s no guarantee you’ll win the business. Sales success depends on insight and — even harder to quantify — empathy. That’s why every good salesperson researches their prospects prior to making contact. Before social media, this could be tough. The best a salesperson could do was check out the company’s website, wade through the annual report, and check for mentions on trade websites. Salespeople often felt like they were merely skimming the surface — with little hope of gaining the deep insight into a prospect’s needs that it takes to really tailor a pitch. Armed with this information, it’s a lot easier to put together an insightful, emotive sales pitch — one that’s less “me, me, me” and more “you, you, you.” Salespeople can show how products and services directly solve the issues their prospects are facing, even issues that prospects have yet to identify themselves. Plus, they’ll have a far clearer picture of whose buy in is critical in making the sale. In sales, getting the drop on the competition can be the difference between a monumental deal and a crushing disappointment. Increasingly, you don’t need to wait for your rivals to take out a banner ad to discover their latest play. Major initiatives are generally the result of months of planning — months in which core themes will be trailed in presentations and conference speeches, and may even be discreetly tested on chosen segments of the market. Social tools can help provide advance notice of such significant shifts in positioning. They can help you monitor what your competitors are saying, what individuals within their company are saying, and the responses they’re receiving — letting you spot competitive movement earlier and react faster. Set up Google Alerts for terms related to the competition (brand names, products, or key people). Join key customer groups on LinkedIn and begin monitoring what they’re saying. Monitor SlideShare and Scribd for new presentations and documents created by your competitors and their partners, and for events they may be attending. Follow customers, competitors, and thought leaders on Twitter. For additional insight, look at Q&A sites such as Quora. 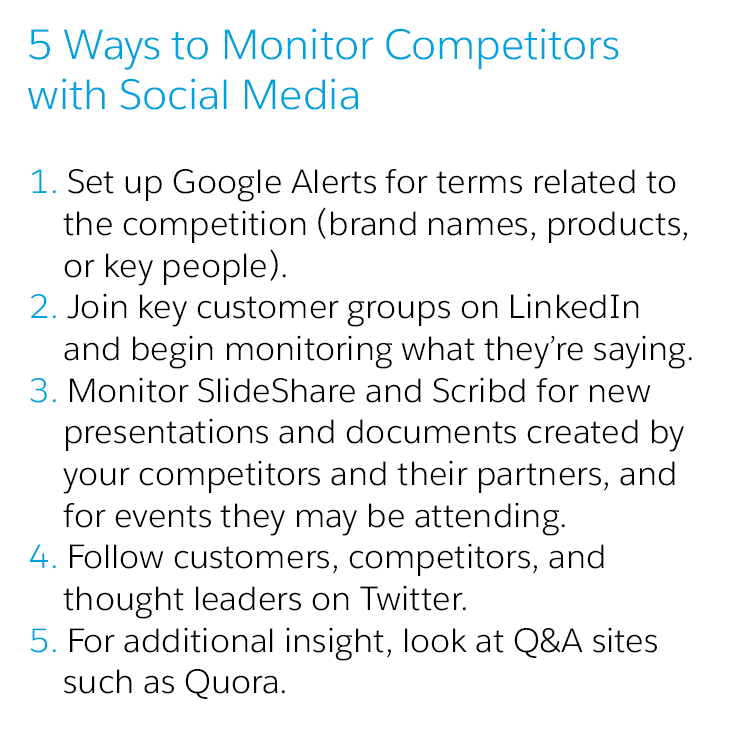 Social tools don’t just help you monitor the competition. They show you what your customers are doing and saying too, offering precious insights into issues you’d fail to spot by any other means. Proactively address those issues, and you stand to save both you and the customer a costly breakup. Research shows that 62% of customers say they share bad customer experiences with others. But the good news is that 72% say they share good customer experiences with others. So while social can help you spot unhappy customers and rescue the relationship, it can also help you identify your advocates. 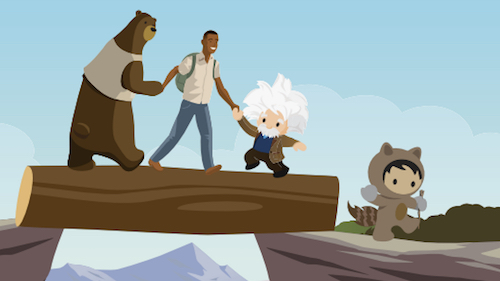 With customer-centric strategies on the rise, there’s never been a better time to embrace social selling tools — to find new customers, craft personalized pitches to meet their needs, and bring the right people together to make the sale. 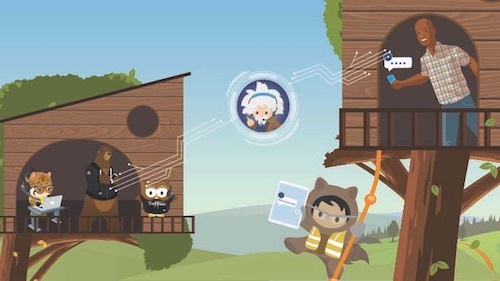 If you’ve enjoyed this article, get more insights like this from the Salesforce Blog newsletter.